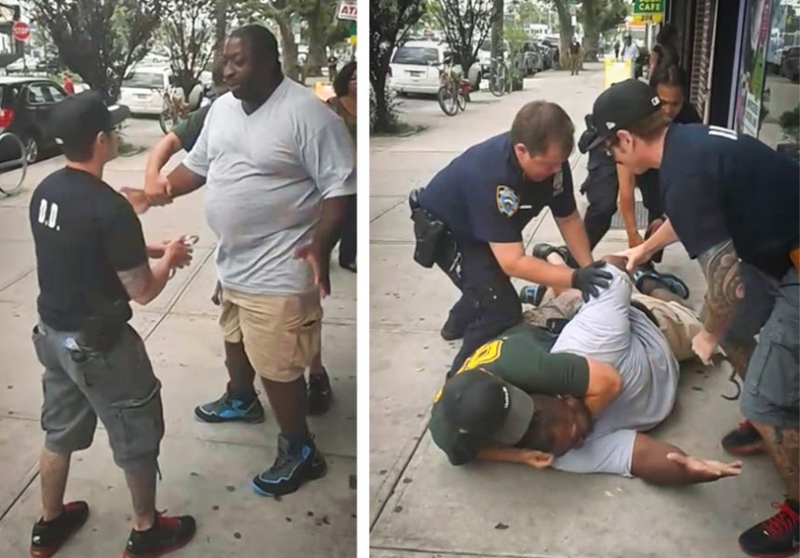 What happened to Eric Garner on July 17, 2014, is plain to see in the video. The large, 43-year-old African American man is arguing with police officers over allegedly selling cigarettes on a sidewalk in Staten Island. One of the officers, Daniel Pantaleo, puts Garner in a chokehold from behind and wrestles him to the ground. He holds the chokehold for about 15 seconds. On the ground, Garner says, “I can’t breathe” eleven times as four cops work to pin Garner down. The coroner ruled that Garner, father of six, died from compression of the neck due to a chokehold. Pantaleo said he never put Garner in a chokehold. The video shows Pantaleo putting Garner in a chokehold. Pantaleo was not indicted by a Richmond County jury. Taibbi tells the story of everything that contributed to this moment: the real-estate scams that contributed to the poverty of the area and the racist “stop and frisk” police tactics that exacerbated mistrust between the police force and the African American community. He tells the story of Garner, a far-from-perfect cigarette hustler who lived in and out of jail. He tells the story of the characters around the neighborhood, like Ramsey Orta, who filmed the murder and would later be harassed by police as retribution. He tells us about Pantaleo, a cop with a sketchy record, to put it mildly. In short, Taibbi gives us context. Police brutality cases always begin with spasms of rage or bad judgment—usually an individual police officer losing it on the streets. But before the body is even cool, the crime moves up the chain…While the cases often begin as unplanned murders and assaults committed in a heat of the moment situations by working-class cops, they end as carefully orchestrated cover ups, committed in cold blood through the more ethereal, polished institutional racism of politicians, judges and attorneys. The system kicks in to defend the system. It doesn’t matter what the video clearly shows. Imagine if there had been no video. But he doesn’t pull punches when describing Garner’s flaws either. Or the mismanagement of the Black Lives Matter movement. It’s a story with complex elements coming to this very simple, tragic moment of a cop killing a man on a sidewalk, then spiraling back out to a complex mess. The protests, the counter-protests. It’s ugly and sad. This was about a month before police shot Michael Brown and Ferguson, Missouri erupted. “I can’t breathe” morphed into “black lives matter” and it seemed a story of a police shooting was happening every few weeks, followed by protests, sometimes riots. There are many infuriating things about this story. The abuse of power and ensuing denial of the police, certainly. But also the ensuing debates, the polarized reactions that break down along expected, tired lines. The slogan of “black lives matter” met with the tone deaf “all lives matter.” Or countered with “blue lives matter,” which just reinforces the feeling that the police are the enemy of the African American community. The tribalism is so engrained, and it has only grown worse since Garner’s murder. Regardless of the details, any time an African American man is killed by a cop, the debate is predictable. But here, with Eric Garner, it’s hard to see how there was anything to debate. The success of this book is the degree to which Taibbi is able to explore the history and the issues that led to Garner’s death as well as the movement sparked by it. It is both small and big—about a simple, flawed man and a singular moment in time, but also about a major American problem that stretches back decades and, unfortunately, will likely continue for decades more. Well worth the read.